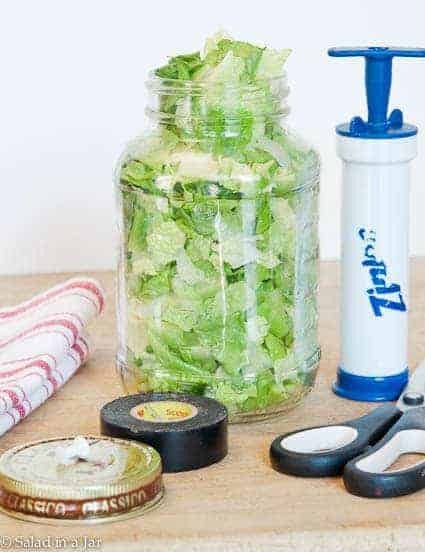 How To Vacuum-Pack Lettuce for Less is an inexpensive way to vacuum-pack lettuce using Mason jars, a thumbtack, electrical tape and a hand pump. I’ve attached a video to make the process easier to understand. Addendum as of August 2018: Unfortunately, since I first published this post, the price of the Ziplock hand pump has increased to over $20 and has not been spotted in grocery stores for a long time. Luckily, you can still get it on Amazon here. Many people tell me they are curious about making How To Vacuum-Pack Chopped Lettuce To Preserve Freshness but don’t have or can’t afford a vacuum-pack machine. A few months ago, I was elated to learn it can be done with a portable vacuum-pack machine costing around $20. But now I’ve discovered something even cheaper, thanks to my blogger friend Vicki. 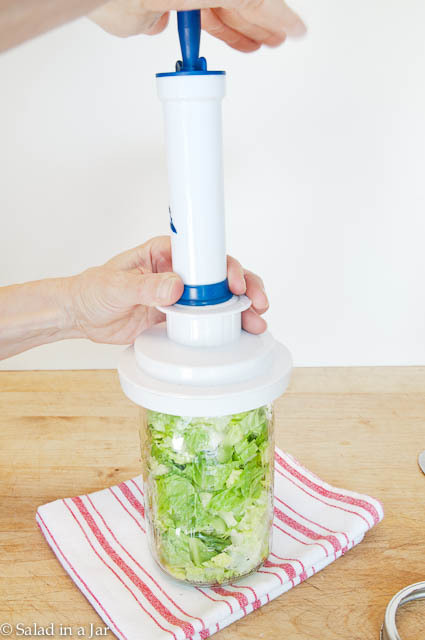 Ziplock sells a hand pump that will vacuum-pack a glass jar of chopped Romaine quite inexpensively. It comes with 3 vacuum-sealable Ziplock bags (useful for storing big chunks of cheese), and can be found in the same area as aluminum foil and plastic wrap. In addition to the pump, you will need a thumbtack, electrical tape, and a clean glass jar. Regarding the jars, use a glass canning jar or a repurposed glass jar (such as one spaghetti sauce or jelly might come in) with a screw-on lid. Some twist-on lids may also work if they form a tight seal. Click below to see a quick tutorial showing how to do it, or look through the pictures below. Note: New to the idea of vacuum-packing prepared lettuce? See this post for more details about the why and how-to of this technique. 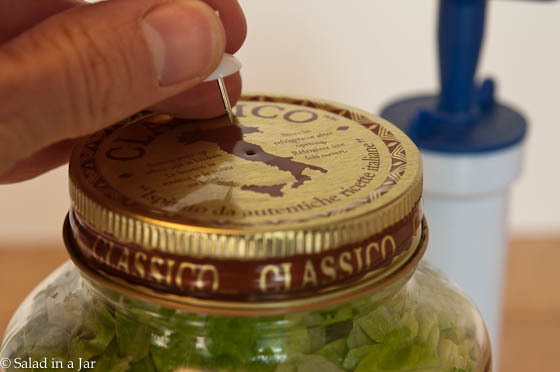 Securely screw the lid on your lettuce-filled glass jar and poke a hole in the middle with a thumb tack. Cover the hole with a SMALL piece of electrical tape. Center the hand pump over the tape-covered hole and hold the pump firmly against the lid. Pump until air-tight seal is created. Run your finger over the tape to be sure it is firmly adhered to the lid. The easiest way to open a sealed jar is to peel off the tape which will immediately break the seal. Or, you can strong-arm the lid if you have substantial muscles. 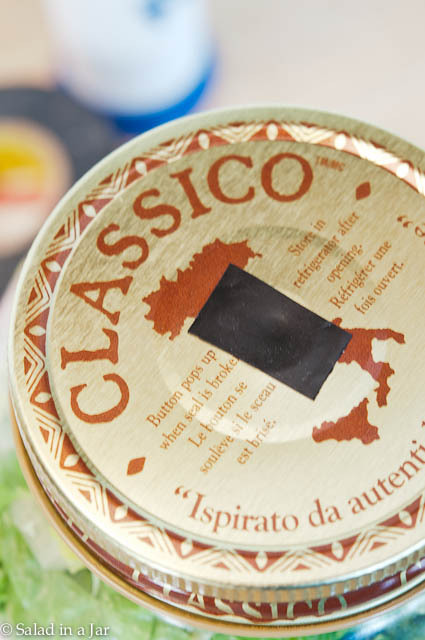 It’s a good idea to check the seal occasionally while the jars are in the fridge to ensure the seal holds. Do this by bouncing your finger quickly on the lid. If sealed, it will not move. 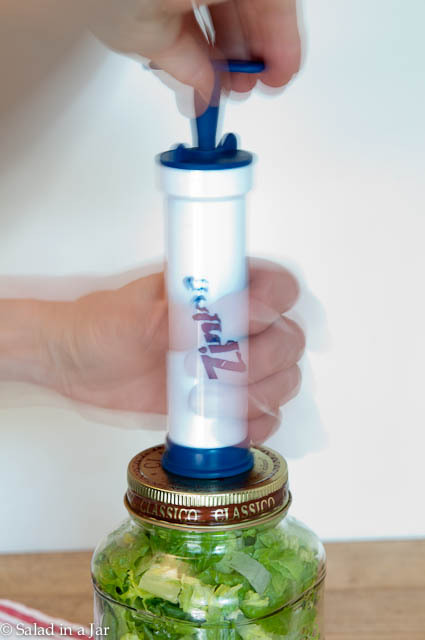 When the seal is broken, the flat lid will move up and down slightly and make a noise. Re-vacuum with a new piece of tape if you aren’t quite ready to eat the contents. Of course, the sooner you discover the broken seal, the better. In general, the large vacuum-pack machines make a stronger and more dependable seal. However, the hand pump is a good way to try the whole “vacuum-packing-lettuce-in-a-jar” concept if you don’t already own a machine. You can also do this with Mason glass jars with two-part lids. See the video above for a complete demonstration. Try a smaller piece of electrical tape. Tape may be too tightly adhered to the lid before you start to pump. Remove and replace with a light touch. The lid may not be sealing the jar completely. Twist-on lids are the most frequent offenders. If you already have the wide-mouth attachment, you can avoid putting holes in your canning lids by using it with Mason glass jars. Place the flat part of the lid on top of the Mason glass jar, then cover with the large-mouth attachment. Center bottom of hand pump over the hole in the top of the attachment. Pump until air is removed and flat lid is sealed. Remove wide-mouth attachment and cover with collar. This lettuce was chopped, dried and vacuum-packed in a re-purposed spaghetti sauce jar with a hand pump. Eight days later, the lettuce has no brown edges and is crispy and ready-to-eat. P.S. The blue writing on the hand pump rubs off on your hands in an amazingly quick and annoying way . You can see in the pictures how half of the writing is already gone. Coat the plastic barrel of the pump with vegetable oil and then use a paper towel or a little scrubbie pad to remove it. Which Vacuum-Pack Machine Should I Buy to Vacuum-Pack Lettuce In a Jar? Is a Plastic Knife a Substitute for Vacuum-Packing Lettuce? Can I Add Other Foods to My (Vacuum-Packed) Jars of Lettuce? Can you purchase the big #10 cans and put them in smaller jars? If so, how long can they be stored? #10 cans of what? Vacuum packing is only for non-perishables or food such as produce that will be refrigerated even after vacuum-packing. In others words, vacuum-packing will not substitute for heat-processed canning. Vacuum-packing will help prolong freshness in perishables when refrigerated or frozen. This is VERY IMPORTANT to understand. I don’t want you to get sick. Fast & easy to use it! Saves time and makes freezing food in small portions so very easy! Yes, the large jars are quite handy. Thanks for writing. I’m so glad I found you. I decided to try with a used lid (previously used for hot bath jelly canning). I save them for things I want to seal short term in the fridge. It worked perfectly and I did get a good seal with just the Ziplock pump and the tape. (I don’t reuse lids from pressure canning.) The ‘hardest thing’ was punching the hole with the tack. Good to hear from you. Yes, you can get a pretty good seal but in general, doesn’t last quite as long as something sealed with the large jar attachment. Thank you sooo much for sharing this.. Love it.. Depends on how good a seal you make to start with. You’ll probably need to experiment a little. Hey its awesome. I am thinking to get one of them. So nice to get an idea about the vacuum sealer. Thanks for this post. Wow Paula! It seems that you are an expert. Maybe you can help me. I don’t like to use the spinner for drying the lettuce, do you know any other way to do it? I have arthritis in my hands but I try to live a normal life. However I have to be careful not to over do it. The only way I know: after washing it, put it on paper towel. It takes to much time and does not look fresh after a while. Thank you very much for your ideas, which I stumbled into while doing google search for sealed salad container. I’m committed to try this for my daily salad. If successful, I’ll make my 7-days’ salad on Sat/Sunday. Where do I buy the little hand pump please (make/model, if you still remember). Much appreciated. It has been awhile since I looked for the pump, but I have seen it at Walmart. Amazon carried it at one time, so you might look online. wonder if this could be used for cold press.. leave a bit of a vacuum while the coffee cold soaks..
Ok I LOVE this idea for other things as well (juicing & fusion water), but here are a few questions I have You stated that the Ziploc hand pump was avail in the grocery store? What section ? Also, It appears that you are only putting the lettuce in the jar not the “fixins” I am guessing that I could try that since I would probably only be making 4-5 days worth at a time… For some reason I have been saving ALOT of my glass spag. sauce jars not really sure why but now I have a use WOO HOO !!! Ziploc hand pumps are usually found next to the Ziploc bags in the grocery store. Check Walmart or look online. I don’t recommend adding the “fixins” when vacuum-packing because of the reasons stated here. Nice that you’ve been saving the spaghetti jars. They are better for sauces than salads because of the narrow mouth. While you CAN use them for salads, they are harder to fill and empty than wide-mouth Mason jars which I heartily recommend. They are cheap and also, they seal easier. Good luck. Where can you get the wide mouth attachment you mention on your video? I tried Walmart, but couldn’t find it. Could you please direct me where to buy it? Paula, Thank you so much for your salad in a jar advice!! I skimmed over all the comments in hopes of finding an answer to my question – but if it’s there, I missed it 😉 I’m wondering if. instead of just the lettuce, an entire salad with all its various ingredients could be mixed up and placed in the jar before sealing? If someone likes a different salad everyday, they could mix it up for each jar. Me – I’d probably eat the same salad for a week! 🙂 Thanks, in advance, for your reply! I’ve been using Pump-N-Seal for a few years now for my dehydrated foods, with mostly good success. However, I much prefer using the Food Saver–much easier on my arms! Just wanted to point out a couple things: Mice can chew through the electrical tape! So I pay attention to where I store pump-n-sealed jars–if it’s tomatoes or carrots or corn or peas, for example, which mice LOVE, I try to keep them in the house instead of the garage. This year I am trying something new with jars that need to be in the garage–I’m adding a protective layer on top of the electrical tape and then taping that down with wide packing tape. And remembering to let the cats in there more often… Another thing is that there are lots of other jars that will take a mason jar lid, so I try the Food Saver first and then if that doesn’t work I use the Pump-N-Seal. 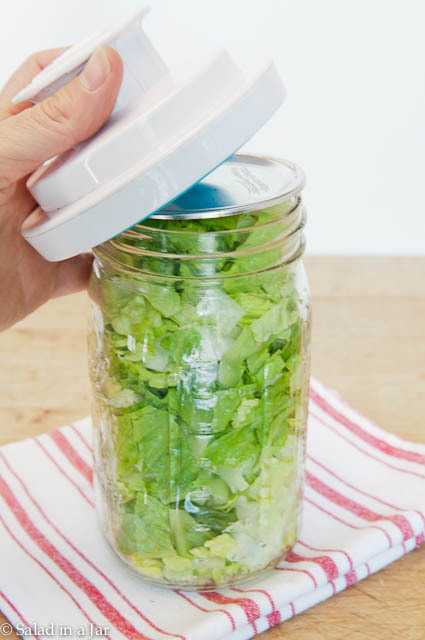 Oh, another thing–some of the smaller jars will fit inside the wide-mouthed mason jars–so you can use the Food Saver to vacuum seal those, too! Amazingly, it does work. I save all kinds of jars but I’m now preferring to use the small ones because they can be vacuum sealed that way–and if not, well, I can still resort to the Pump-N-Seal. Now I must try the salad-in-a-jar-in-the-fridge thing. Thanks for the idea! This is a great idea. How would this work for flower and meats. When I go hunting, I don’t want any of the animal to ever go to waste, ever. I also give about half of the meat to charity or people that I know personally that are having a really tough go of it. It works great for flour. Not good for meats unless you are freezing them. Vaccuum-packing is not a substitute for heat-processed canning. Perishable foods must be kept refrigerated or frozen, even when vacuum-packed. Good information for when the lights go out – however prep your food before that happens lol. Just wanted to mention the Foodsaver seal on a mason jar is much much stronger. You won’t be able to pull the lid off with your fingers – you’ll need something to pry a bit on it. Dennis, you are mostly correct about getting a better seal with a full-size vacuum pack machine. The hand pump and smaller machines will also seal well but you may have to vacuum longer. I love my Reynolds handi-vac and use it every day with great success. It is small, uses batteries and is easy to throw in a drawer and really does just about as good as a full-size FoodSaver. I agree on the Foodsaver seal. Those darn Foodsaver machines just don’t last very long. Thankfully, there are alternatives. Love the Reynolds Handi-Vac as long as it has good batteries. It will give a very good seal also. I have been making salads in a jar for the last 3 months. I use quart jars for salad and pint jars for fruit salad. Some people say to add salad dressing to the jars, but i prefer to add it when i open the jar. Would this work for fruits and other vegetables as well? I would definitely love to have my chopped onions last a lot longer, as well as small batches of berries that don’t seem to last as long. I make my own hummus and I’m hoping it will last longer if I put it into a vacuum-sealed jar as well…. Have you ever tried vacuum-sealing other things in your refrigerator? I have experimented a little but not too much. Can only suggest you give it a try. I’m so sorry the tape didn’t work for you. I will be glad to explore the technique further with you or you could buy the attachment and vacuum-pack that way. It’s only 10$ and it’s foolproof. The bigger issue I’m concerned about is that you recommend heat canning instead. These two techniques are not interchangeable. If you are making jam, please DO NOT just vaccum-pack it. It must be heat canned. Perishable goods that are vacuum-packed MUST be kept in the refrigerator. Quick question about the attachment, should I get a wide mouth attachment even though I have regular sized mouth mason jars, or just get a regular sized attachment? Thanks for the help! Your attachment must match the size of the jars you want to seal. I was wondering, I already have a handheld food saver pump. Would that work in place of the ziplock pump? Also I saw someone else comment that it worked with regular ziplock bags. Have you tried this? If so and it did work do you think I would be able to use it to freeze stuff too? I hate getting freezer burn on my meats. Thanks for you help! Yes. A handheld food saver pump works even better than the ziplock pump. Check out this post. I don’t see how a hand held or ziplock pump would work on a regular ziplock bag. Even the ziplock bags specially designed for the ziplock pump don’t hold a seal for very long. I have much better luck just putting my food in glass jars and using the attachment to seal them. That is the most fail-proof way to do it. Check out the posts listed on this page for LOTS more information. This is so cool! I love buying food and making food in bulk, and now I know the perfect way to store them! Can’t wait to try it out. Thank you so much for sharing this! Please give me some way to keep my hulled pecans to keep them fresh. If vacuum method will work, please let me know. I have lots of pecans we grow and need my freezer space to store food that has to be frozen. My freezer is just full of pecans. I have always frozen them myself but I think vacuum-packing hulled pecans in Mason jars or the plastic bags sold by FoodSaver might be an excellent alternative. But I can’t say that I’ve done it myself for any length of time to prove that it works. I’m going to try it though and see what happens. Saw your question and thought I’d share my experience. I have been sealing both pecans and walnuts in jars for over a year. It just amazes me how fresh the nuts are, even after a year! I recommend the jar method vs the bags. You can just open up the jars and re-seal as you go. The lids can be used over and over (unlike heat canning). I’ve used lids easily 20 times and they are still going. If you do intend to do food storage long term, check the lids monthly as sometimes they do lose their seal. It doesn’t happen very often, but once in a while I have found one. No problem – just reseal. Try it – you will love it! Great website & ideas!!! So, what about putting meat products like cooked chicken, ham/turkey, eggs…things like that in the salad jars? Does that stay fresh as long as the salad typically does alone? Adding other ingredients changes things, usually shortening the time you can keep the salad. The layered salads you see on other blogs are not vacuum-packed. That is an entirely different game. Check out this post to see my take on the whole matter. I’m back to report that you have created something short of a revolution for me and my friends. I have been using this system for a little over a month and I’ve gone down 1 1/2 pants sizes. My 10 yo son teased me of starting a business going door to door selling the hand held vacuum, mason jars & accessories. I found the hand held on sale and purchased them for my friends, I purchased cases of jars and split them up. I even went to their homes and demonstrated how to use the system, well one gf is in Canada but had her package for her when she visited, there are 4 friends in total that I’ve hooked. I thought it was funny that he noticed that. Also, my 8 yo daughter came in 3rd place in the science fair. Guess what her project was about? You guessed it- Got Fresh Lettuce. She learned so much doing the experiment. Her hypothesis was that she could spray lettuce on a plate with water daily bc of the sprinkler system in the grocery store and bc water is used to make it grow. By the end of the project she learned that the water made it spoil faster and because it was cut up it couldn’t grow anymore. She also realized that the vacuum removed the oxygen from the jar and the plate was exposed to oxygen in the fridge. I was amazed by all the learning. So thank you! You have affected my pants size, everyone in my house eats more salad and helped my daughter discover so much through her experiment. Your comment made my day!! Thanks for taking the time to write. I’ve never thought about the effect of the whole water sprinkling thing on lettuce or any other vegetables. Very interesting. Congrats to your daughter on 3rd place. Also, congratulations to you on losing weight. Makes the 20 or 30 minutes a week it takes to prepare it all worth it, doesn’t it? On top of that, it’s not expensive or weird food and is extremely versatile so you don’t get tired of it. I’ve been doing it for over 8 years now–at least 5 days a week with no change in dress sizes despite food blogging for 3+ years. I just got my hand-pump, YEAH!! QUESTION: Can the same technique be used for liquids, such as fresh juiced greens? Then I would only need to juice once per day. When you juice, freshness counts! Keeping the oxygen out would extend the “life” of the juice. For me personally, I would vacuum seal the juice to use only later that day. I would not keep it for several days in the fridge. Hope this helps! Thank you SO MUCH for this amazing tip!!! I absolutely never bring salads to work because I can’t stand how quickly expensive/organic lettuce goes bad and gets slimey, or gets crushed in a baggie, etc. I just went out yesterday to buy the Ziploc hand vac (Walmart was the only place that carried it in the SF Bay Area oddly) but was disappointed to find that no store in a 20 mi radius carries the wide jar sealer attachment 🙁 BUT I decided to ‘ruin’ my mason jars with a hole and tape. I did this thinking there’s no way I’d get a good seal on this thing but voila it worked like a charm! I really cannot thank you enough. When I talk about drying the lettuce I am referring to spinning it or wiping it dry of excess moisture. Although it is sealed, you absolutely must keep in in the fridge until you are ready to eat it. Oops! The link wouldn’t post so I’ll try again. Hi Marlene, All the information you need is on my blog. Start here. I’m back again. I have 7 quart sized jars and I just want to start with that. How much salad do you think I need? Is this enough for the warehouse romaine or should I start smaller? Checking back in and it worked!! I’m so excited, I’m starting today. I’m glad I finally decided to Just Do It! I will work with what I have and graduate to the jar sealer if I can’t find it on my thrift runs. Also, it’s science fair time and I think my 3rd daughter will enjoy doing the experiment that you did and it might teacher her teachers a little something too. Nice to have adult Science lingo to help keep us going. I LOVE the BLOG! Here’s to a healthier me! I don’t blame you for being frustrated. I went looking for the Ziplock pump this weekend at 2 different Krogers and they also did not have it. However, they had a bunch a Walmart. Hope you have one close to you. If you find you like the whole idea of vacuum-packing lettuce, I would encourage you to get the wide-mouth attachment. It really works better and easier than the electrical tape method although that method is a great way to try out the process. Can you provide us a link for the hand pump on Amazon? Thanks! Hi Jonathan, See link above. ???? COFFEE BEAN QUESTION ???? Illy Coffee cans are vacuum sealed and have a little hole in the bottom of the can. Over the hole is a piece of ‘tape’. Couldn’t the beans be resealed with the pump placed over this taped hole. Then we could have a cute little opaque coffee tin always vacuum sealed. Seems this would work for many formerly vacuum-sealed tins, eh? Love your site! Yes, absolutely. A few things that come to mind: jar of spaghetti sauce, condiments, etc. I used to vacuum pack my coffee but a reader commented that constantly re-vacuum packing my coffee would draw the flavor out. But that was ground coffee. Not sure if it would affect coffee beans the same way. Your welcome Junell. Hope you enjoy your salad as much as I do. Am so enjoying your blogs and learning so much. Also saw your making of greek yogurt. Thank you! Since the thumbtack through the top of a Mason jar worked so well, I wondered if it would also work well on a ziplock bag. IT DOES! I poked a small hole in the bag in the corner with the thumbtack, put a small piece of tape over it and used the Ziplock hand pump to pump out the air. I’ll let you know how long it lasts. Wow. Thanks so much for sharing this, found it via pinterest. I have been continually frustrated with my ability to keep salad fresh between visits to the store. I usually end up throwing a third to half out because it goes bad and consequently don’t eat as much as I would like for my health. I had to throw out half a bag yesterday because the stuff got all brown and runny. Really ticked me off because I was looking forward to a salad for lunch. This looks like it will change that. I’ve been wanting to do this and I finally remembered to grab the ziplock pump and did it–it’s so exciting! I’m looking forward to just grabbing the lettuce out of the fridge and having it ready to go! Thanks for both the explanations and the videos–they’re great, as are you! For cookies an things you want to open an close repeatitly. use the zip loc style vacuum bags from food saver an i belive ziploc makes them to, they make the pump. Both have a vacuum (port) on them. I really like sealing in jars an not having to use the electric food saver. Thank you so much for this post. I’m going to try it. I’m always throwing lettuce away. I read your post a few days ago, and then this weekend found both a vacuum machine with bags for $5 at a garage sale…then next stop same day I found the Ziploc hand pump for 25 cents! 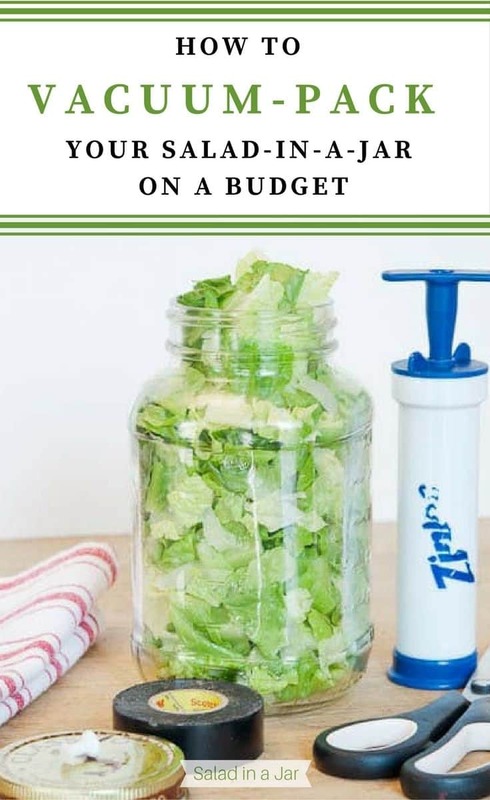 I am so excited to get the salads in a jar going for better, healthy eating, and I’m always trying to find ways to save money on food–it gets more important every year! How lucky for you on your garage sale finds. Hope you like vacuum-packing lettuce. It makes it so much easier to eat a lot of salad. 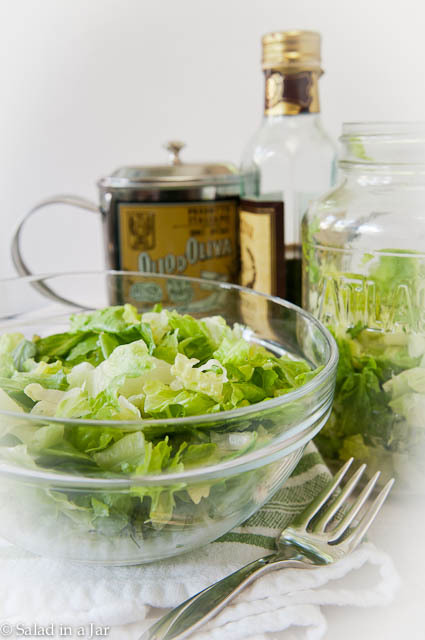 I heard that the salad in a jar stays fresh even without being vacuum-packed. What are your thoughts. And where can one purchase one of these tools? I did an experiment and posted about it comparing chopped Romaine lettuce that was vacuum-packed with some that was just stored in a closed glass jar. You can read about it here. If you don’t chop the lettuce, it will last longer even when not vacuum-packed but I want lettuce that is ready-to-eat out of the jar. You can buy a hand pump at most grocery stores–the Ziplock brand. See my other posts listed here for information about other ways to vacuum-pack and where you can buy everything you need. Have a good weekend. I can’t wait to try this both ways! I actually have a Seal-a-Meal and I believe I have attachments somewhere. We have only used it to seal our home made jerky. You’re welcome. Homemade jerky sounds good, too. Lovely blog you have out here!! This post in particular is great. I would have never thought of preserving lettuce in such an inexpensive way. Will have to try doing it soon as I am in a habit of buying big bags of lettuce only to throw half away in a few days. Thanks for the great tip. Will come back more often to read all the other posts on your blog. Hope it will save you some money. another great way to use mason jars! Thanks for the tip. I jumped right over there to check it out. How cool! Hi…I’m very, very new to these ideas. Can you do this with other vegetables to keep them fresh? I saw your comments about pantry staples like flour and pasta (which I may do since my husband has to eat gluten-free and buying in bulk is way cheaper!! ), but in terms of other fresh fruits and vegetables, I was curious. A blog article that features other foods that this method might work for would be awesome! I find that I often don’t get through all of my veggies/fruits before they go bad…Thanks for all the great information! That’s a good idea for a blog article. Some work and some don’t and each vegetable stores for a different period of time depending on their make up and sturdiness. Now that you have a cheap way to experiment, you can try your favorite veggies. The FoodSaver website gives a list of things that are good to store and things not so good although my own personal experience varies a bit from their advice with certain produce. I’ve had several people ask about seal failure on the lids when using the Ziplock pump. You do have to experiment a bit. If you can easily pry the lids off with your fingertips, try a few more pumps. It should be very difficult/impossible to pry off without the aid of a blunt end of a bottle opener. Since I not only seal things for the fridge but also shelf stable foods in the pantry, my seals need to last months and even several years. Once in a while I have had a jar lose its seal. So I check the jars stored in the pantry on a monthly basis and simply reseal it. I first learned about vacuum sealing from a Wendy DeWitt food storage seminar that is on YouTube. She shows a jar of sealed chocolate chips that were sealed for several years and were just as fresh as the day she first sealed them. She tells of finding another jar of chocolate chips that was sealed with her Foodsaver machine that somehow lost its seal and the chips were white and not fresh anymore. So, whether using the Foodsaver machine, a battery operated pump, or a manual pump, it’s just a good idea to check those lids to be sure the vacuum was maintained. Thanks so much for commenting about this, Vicki. Even in the video, I should have added a few more pumps for a better seal. I never thought about vacuum-sealing chocolate chips. May have to try that although we go through them pretty fast around here. A lot of blogs I read encourage families to maintain a grocery stockpile. In my old way of thinking, I would only buy chocolate chips only if I planned to bake cookies in the next week. But in the new plan, I buy extra (even better when they are on sale near Thanksgiving or Christmas or I have a coupon), and when I use some, I buy more to maintain my inventory. That way I won’t run out and I feel great knowing I’ve purchased my grocery items as economically as possible. And thanks to vacuum sealing, I can put the pantry items in glass jars and then months (or even years!) later I can enjoy freshness in longer term food storage. I’ve seen where people get a great deal on candy after the holidays and they buy up quite a lot. If vacuumed sealed, it will last a very long time. No one has to pay full price to enjoy these little “treats” anymore! But I must say that one of my favorite things to vacuum seal in jars is nuts. Buy a large quantity once in the year and then enjoy them for the whole year WITHOUT the worry of price increases! I know that nuts can be so pricey and they just keep getting more expensive. So this is a great way to save money. Although this system can sound intimidating to get started, try having a goal of say $20 – $40 to put aside to purchase additional pantry items you know you need and use all the time. Things like pasta, flour, brown sugar, nuts, seeds, herbs, tea, rice, etc. are all things I use on a monthly basis. I just buy extra – especially if there is a sale. Most grocery stores have a few things on sale weekly that really are a good price. And since they tend to do this in cycles, you can plan your purchases accordingly. And don’t forget that instead of running all over town, Wal-Mart does price match! I hope more people will consider doing this. For a little extra money and hardly any time, you can have surplus in the pantry that was bought at the best possible prices. I personally know a large family that routinely did this. When the father had health issues that forced him to leave his job, one thing they didn’t have to worry about was food. They had plenty to see them through for quite a while. It sure left an impression on me to do the same! “WON” at the grocery game! Hi Paula! I sure hope I can find one of those Ziploc hand pumps and give this a try. You really have the best ideas and tutorials! You just keep great ideas coming. Love your blog. SANDI. Thanks again for your good ideas! Love your blog. Paula, if you could find a large enough jar with a tight-fitting lid, you could do this with cookies. Absolutely. Many people store flour, sugar, rice, and pasta this way. I also do it with granola and biscotti. Would the wide-mouth gallon Mason jars be big enough or how about the fishbowl type glass cookie jars with screw on metal lids? Poke a tiny hole, cover with tape, and pump the air out. In reading over your comment again, I realized you want to seal bags. You can do that with a regular vacuum-pack machine that uses heat to seal. I’m assuming you would not want those vacuum-packed though. Very cool Paula! You got me this time, I can’t afford to not try this! What a simple idea, I’m looking for this pump next time I’m at Kroger, thanks. I just checked out your lovely blog! I am very impressed. I’ll be checking back often to see what you are up to. Keep up the good work Cafe Sucre Farine!